If your browser starts showing NetSurf Ads, i.e., best deals and coupons whenever you are shopping online, it can only mean one thing: Your computer has been infected with an adware program called Net Surf. 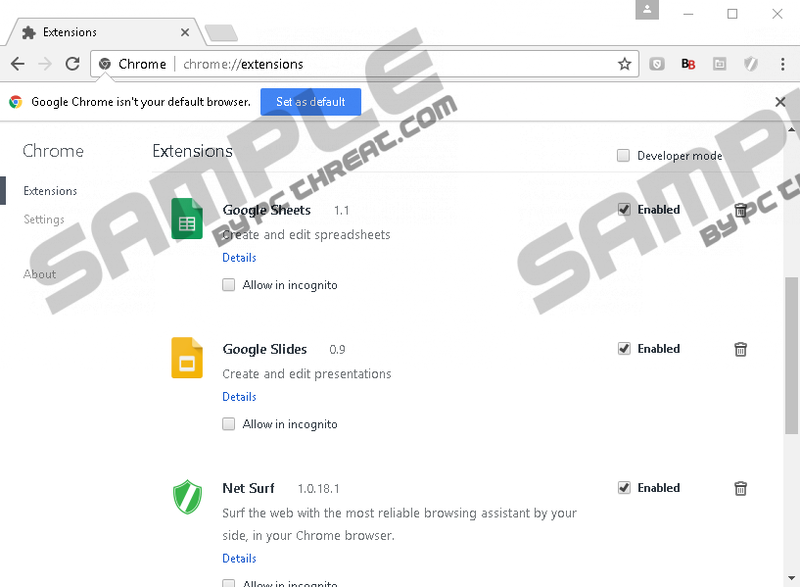 While this browser extension only seems to work in your Google Chrome browser, it may enter your system along with other malicious software installers, which could seriously affect the vulnerability of your virtual security. Although this tool promises you lower prices so that you can save money while doing your online shopping, we have found that this adware may put your system security at risk by showing you potentially unreliable third-party ads. This means that if you click on any questionable ad, you may infect your PC with more threats or open malicious websites that could steal your money if you are not alert. We believe that you should remove NetSurf Ads from your browser if you want to restore your computer; however, this may only be the start because you also need to tackle the rest of the infections. Please read our full report to find out how you can avoid similar threats. This adware is not the first of its kind, of course. We have seen identical ones emerging in the past weeks, including Pro Flip and Enhance Pro. 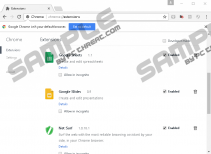 All of these browser extensions are offered by a website called shopmania.ro. Of course, this is not the only source from which you can download this useless and potentially harmful program. The official webpages of these extensions are all very similar. You can find the Net Surf page at net-surf.webstore-advisor.net/us/install, where clicking on the "Add to Chrome" button does not directly install this tool but, instead, you are taken to the Chrome web store, chrome.google.com/webstore/detail/net-surf/dfloejogjogbalabpfaiiionlclpkekk. It seems that around 22 thousand computer users have installed this application yet. But when you have a quick look at the reviews, you realize that this tool may not be what it wants you to believe. There are basically only two reviews. One, that praises this extension way too obviously and one, that calls the previous one a spammer. But this is not the worst about this adware infection although this already could be enough for you to delete NetSurf Ads from your browser. This adware can also be found in freeware bundles that could bring a number of malware infections on board if you are not cautious enough when installing one. Even legitimate bundles may install additional third-party programs that could be unwanted or undesirable for you. Imagine a package that contains browser hijackers, Trojans, fake alerts, backdoors, adware programs as well as potentially unwanted programs. Such a lot could cause a bunch of system security issues for you but your privacy would also be at risk as these malware infections may spy on you and share gathered information with third parties. The most likely ways for you to download such a bundle are downloading a free program from a questionable file-sharing website and clicking on unsafe third-party advertisements that can be offered to you by adware hiding on your system or shady websites promoting such ads. In any case, we strongly advise you to employ a trustworthy malware scanner to detect all possible threat sources on your computer after you delete NetSurf Ads. The advertisements, i.e., best deal offers and coupons displayed by the extension called Net Surf, can be rather annoying as they keep popping up and cover quite a big portion of your screen. Clearly, this is not the greatest issue here though. Unfortunately, these ads have been found potentially unreliable, which means that you could be exposed to ones that may come from cyber criminals in an attempt to lure you to their malicious websites or to infect you with more serious threats. In other words, instead of saving you time and money, as these ads and extensions claim, you could get into more serious trouble. For example, you may open new tabs with fake online shops that offer you a product at a very low price. Sounds tempting? Well, it will not when you learn that this adware may spy on you and collect information about your likes, interests, such as which websites you visit, what types of ads you tend to click on, how long you spend on pages, and more. Based on this, customized best offers and ads could be sent to your screen. Whenever you see an ad that promotes a product of your interest, you should think twice before you click on it. Remember that on a fake website you could be asked to enter your personal or credit card details, which can be used by criminals to steal your money and commit other frauds online. This is why there is no doubt that you should remove NetSurf Ads right away. The only good thing about this annoying adware infection is that it only affects your Google Chrome browser and that it seems to operate through the Net Surf extension, which you can easily remove through your Settings menu. If you are not familiar with this process, you can use our instructions below. Do not forget that this may only be the first step as there may be other malware threats lurking on your system. If you are looking for an effective way to step up against all existing malware programs and threats, we suggest that you install a reputable anti-malware application, such as SpyHunter. Click Show advanced settings at the bottom. Then, press Reset settings at the bottom. Quick & tested solution for NetSurf Ads removal.